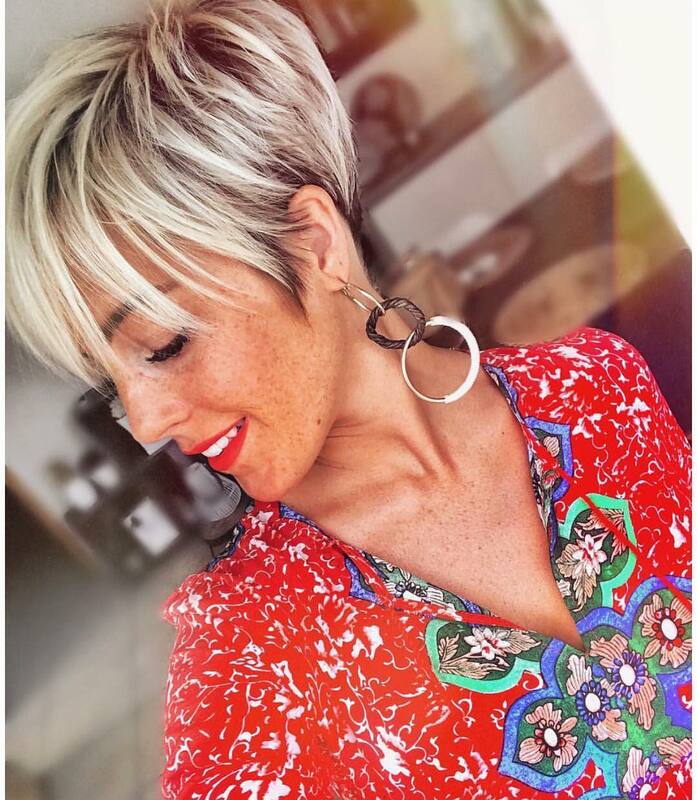 Many women want to try out a super-short hairstyle, but are afraid to pull the trigger on a pixie haircut. 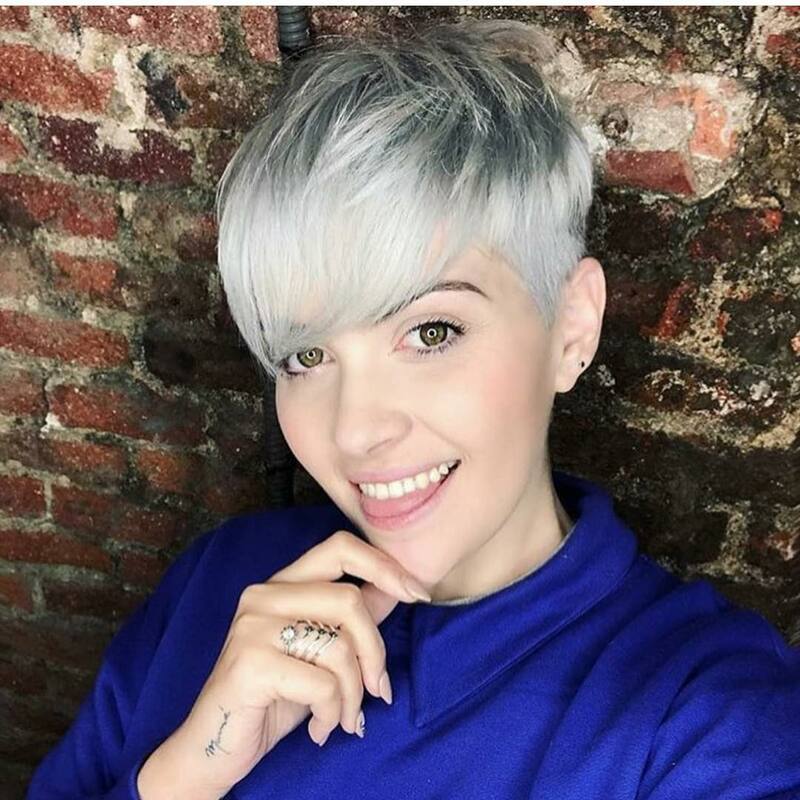 One of the most common misconceptions about pixie cuts that deters many women from facing the scissors is the idea that pixie cuts are masculine. 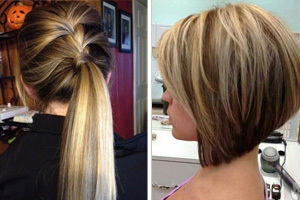 Most women who fear looking masculine with a pixie cut tend to opt for pixies with longer layers. 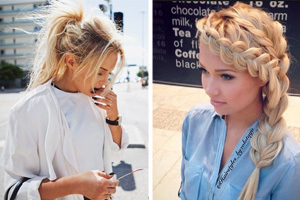 While these long-layered styles are beautiful, they can be more challenging to manage and maintain. 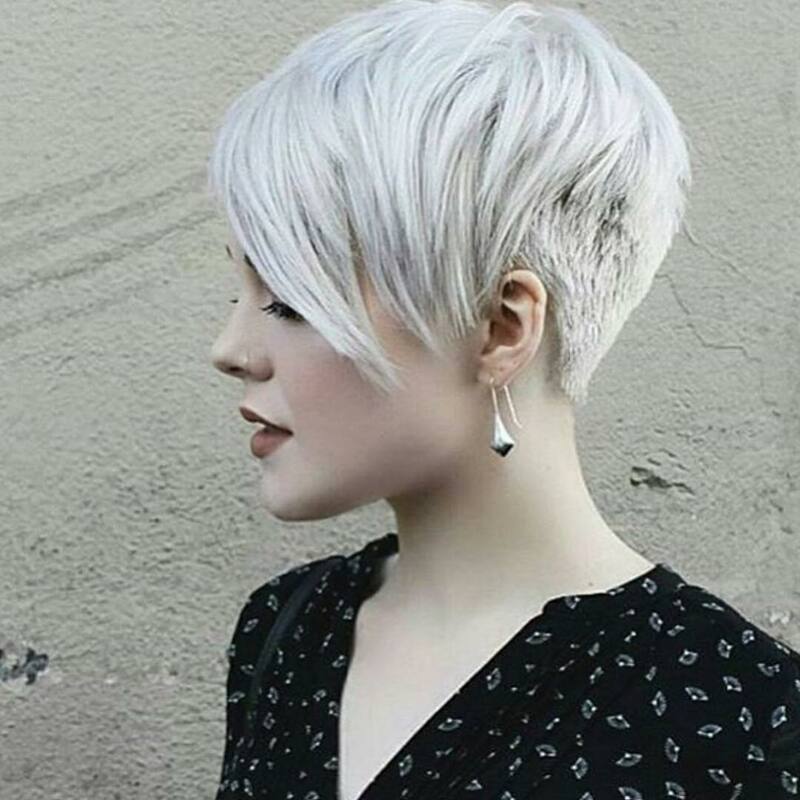 This bleached undercut pixie proves that even close-cropped pixies can look pretty and feminine. Its bottom layers are buzzed for effortless styling, but its longer layers on top still give it a delicate, feminine vibe. 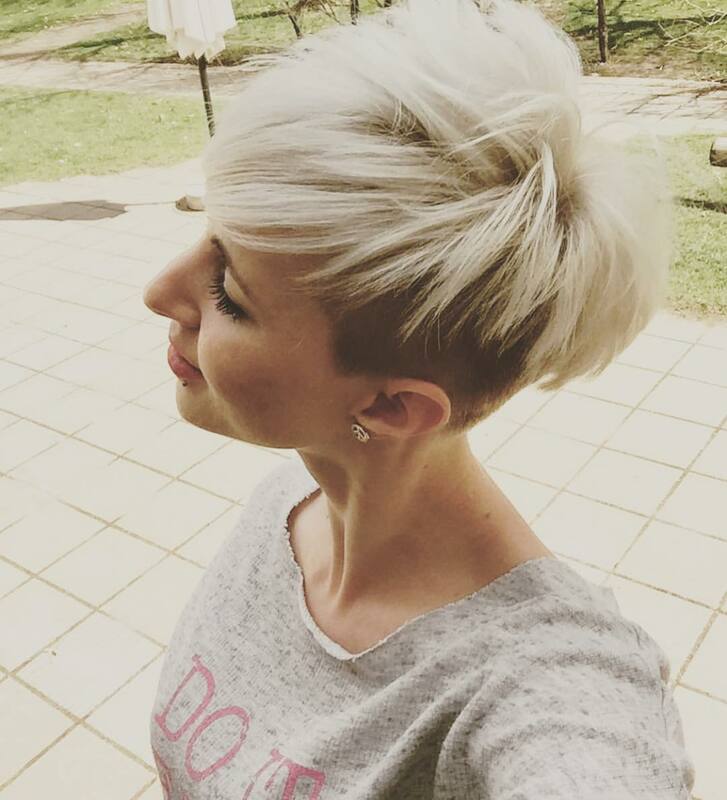 This white blonde pixie is sleek, smooth, and easy to manage. It is a very versatile style with varied layers that add much-needed texture and dimension to keep this cut from falling flat. You don’t have to bother with styling the close-cropped back layers of this pixie at all. Just straighten its sideswept bangs and add a smoothing or shine serum to achieve the feminine, fairy-like style from the picture above in minutes. 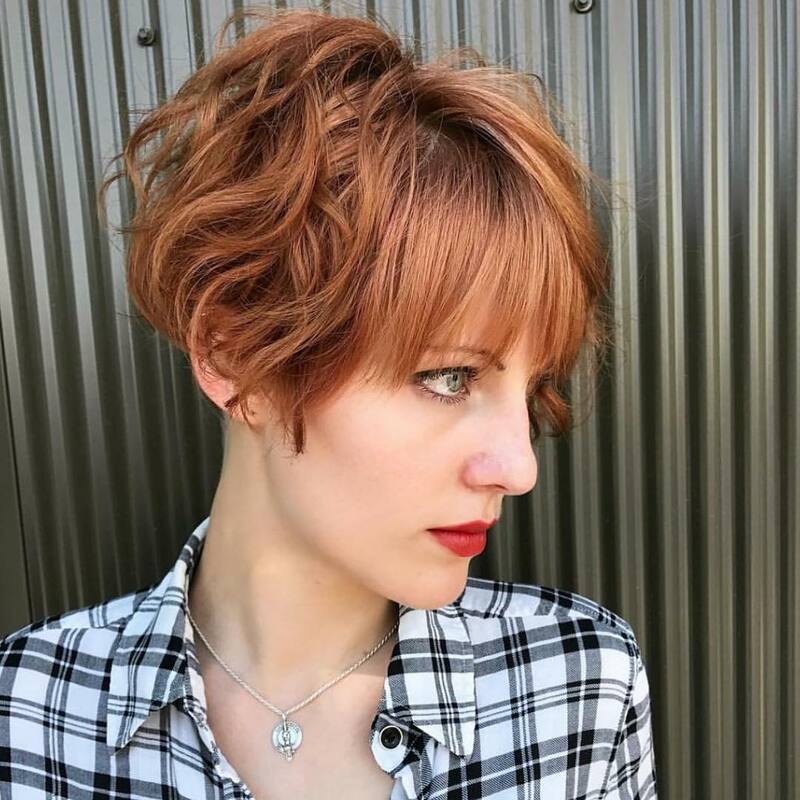 Get a gorgeous, vintage-inspired short style with this curly red pixie. Its short, curly layers are full of bouncy volume. The long, rounded piece-y bangs of this pixie are straightened to add a sleek finish to this cut. 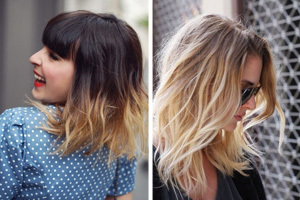 Its bangs and longer front layers also help define your features and frame almost any face shape in a flattering way. 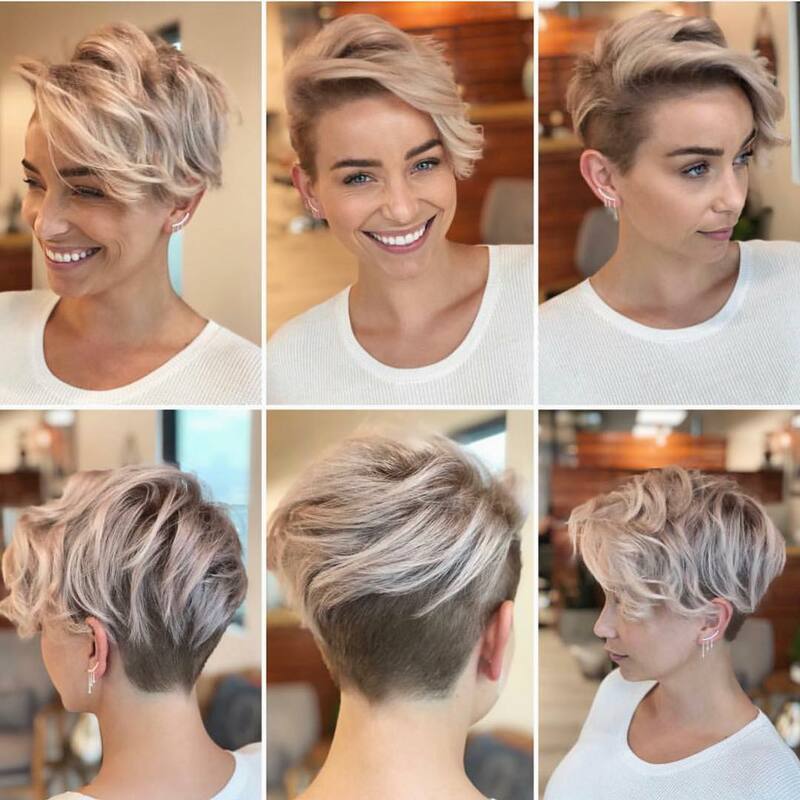 If the long front layers, sideswept bangs, and relaxed ringlet curls didn’t emphasize the femininity of this pixie cut enough, its subtle lilac highlights definitely do the trick. As an added bonus, this pixie cut is easy to style to perfection in minutes. 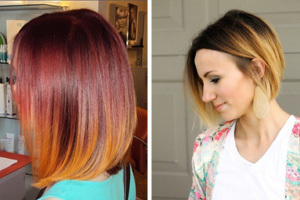 Its back and side layers are so short that they require no styling. All you have to deal with are the longer layers in front, which you can effortlessly curl into loose ringlets in minutes. Get creative with this bright and fun rainbow pixie cut. This ultra-colorful pixie is adventurous and bold, but it isn’t too overwhelming. It is carefully shaped into a classic pixie style with defined hairlines and part for a smooth, sleek look. Plus, the green, blue, pink, and purple tones that this rainbow pixie incorporates are amazingly subtle without looking muddy or faded. 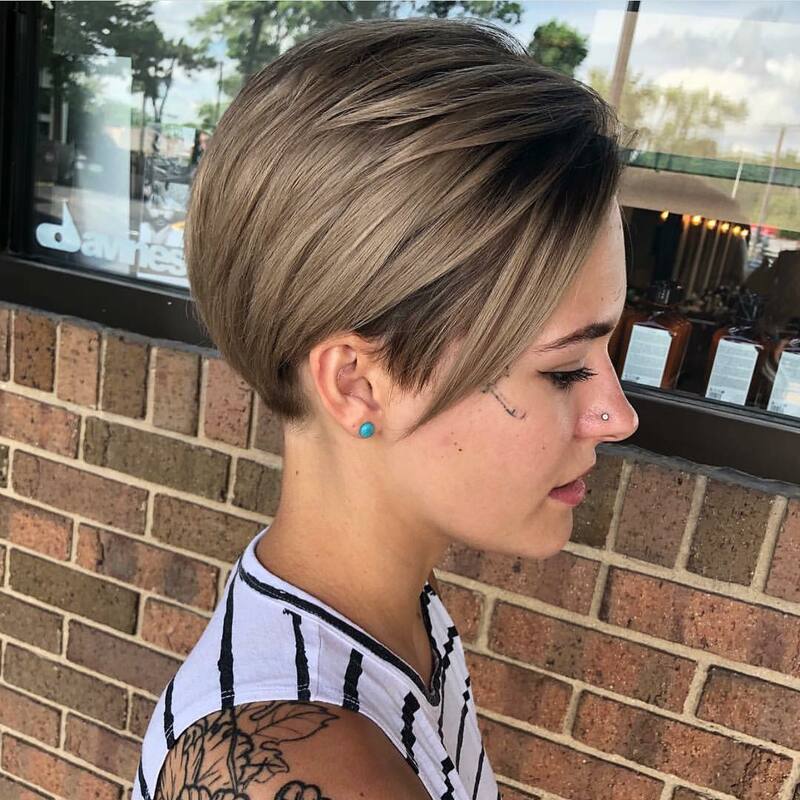 The long, piece-y layers of this pixie are carefully shaped and give this cut instant delicate style that eliminates any hint of masculinity. 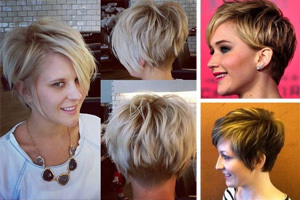 Plus, this pixie haircut is carefully colored for maximized manageability and femininity. It is bleached blonde for a trendy, feminine finish. However, its roots are shadowed to add dimension to this cut and allow you to wait longer between salon visits for root touch-ups. It’s not hard to look feminine with a curly pixie. Ringlet curls are inherently feminine, but they can be hard to achieve in a super short cut. 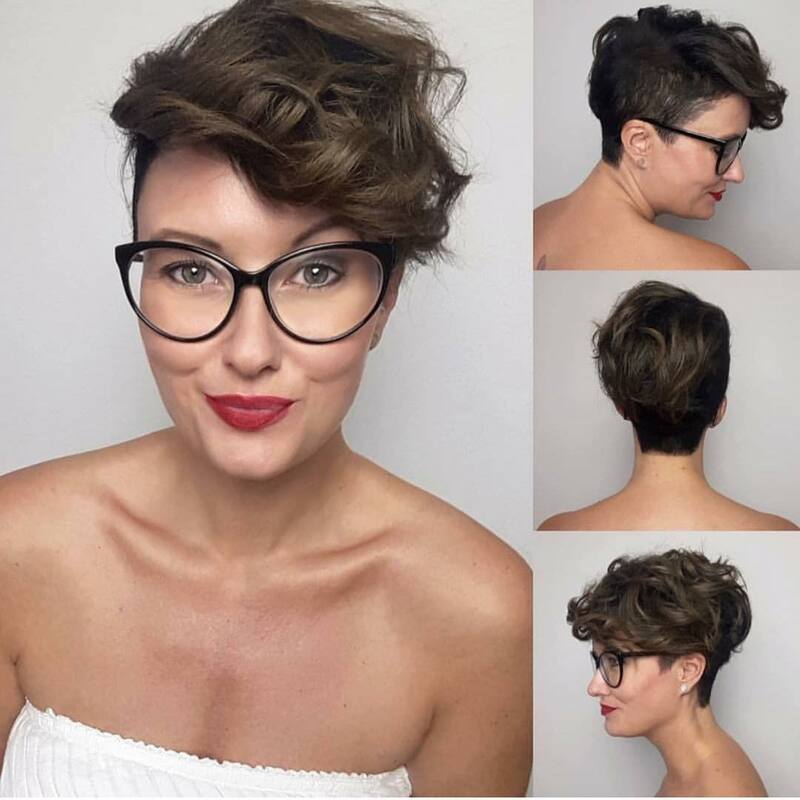 This unique curly pixie cut lets you have the best of both worlds. Its layers are very short in the back and around the sides for manageability and classic pixie style. 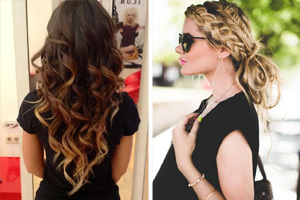 However, its layers on top and in front are long enough to curl into delicate, feminine ringlets. 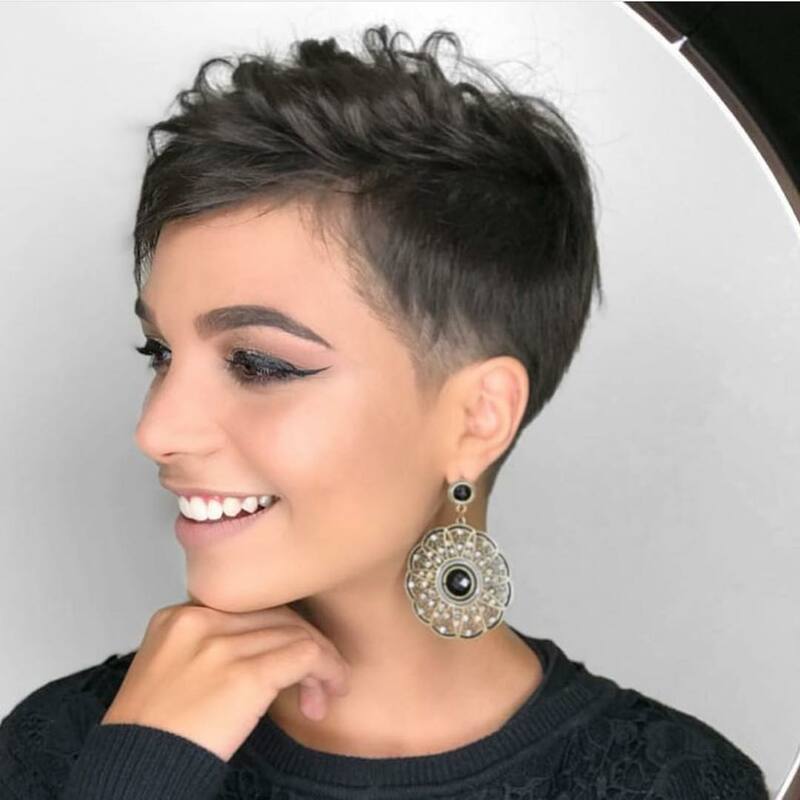 Even the shortest pixie cuts can have feminine style. The gentle fade around the hairline of this pixie is a subtle touch, but it adds delicate femininity to this cut. This pixie is slightly asymmetrical. Its longer layers and wispy bangs on one side give it more shape and a defined structure and part, which contribute to the feminine vibe of longer hairstyles. 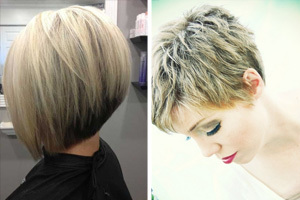 Plus, these textured layers add dimension and bouncy style to this pixie cut. 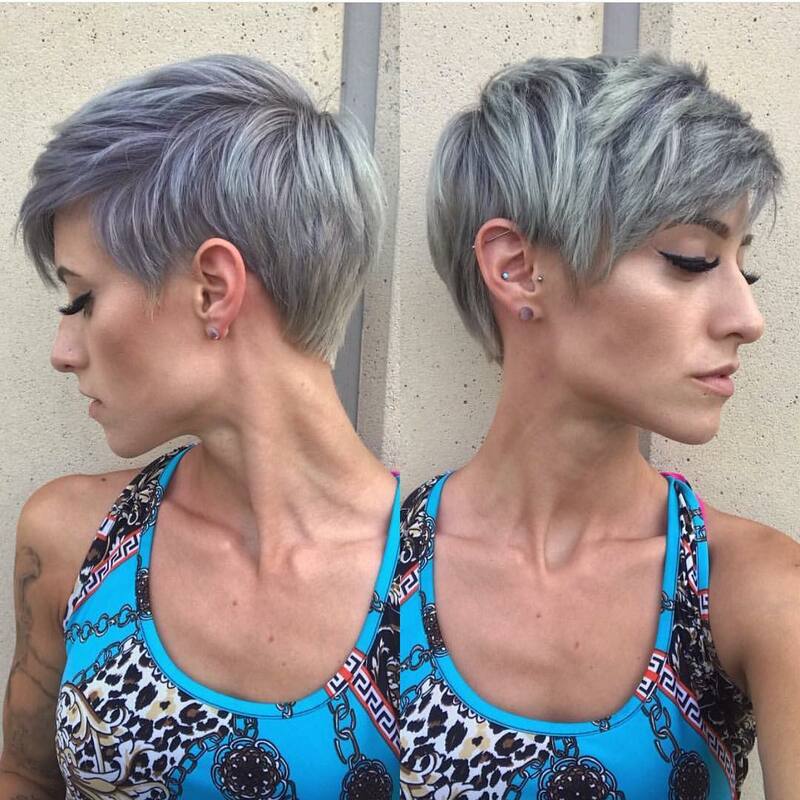 This close-cropped pixie is ideal for women with thin, fine, and wispy hair types.